Roman Reliefs/Friezese: Hadrian, Antoninus Pius, Marcus-Aurelius, Severan, Tetrarchic Eras. Tetrarchs: 4-part division of the empire (284-324). In Roman art, the contrast between the principate of Hadrian, scholar, philhellene, pacifier, and traveller, and that of his martial and more practical minded predecessor, can be gauged from the absence under the former of a series of great commemorative monuments carved with scenes of the reigning emperor's victories and other spectacular achievements. (See also: Roman Architecture.) The Hadrianic sculptures that approximate most closely to Trajanic work (such as that on Trajan's Column) and probably date from the early years of the new regime are two modest reliefs cut on what would appear to have been two sections of a balustrade round a statue of Marsyas in the Roman Forum, since each scene terminates at one end in a figure of him on a pedestal and the splendidly rendered sacrificial beasts on the back of each slab could refer to a ceremonial restoration and rededication of that statue. One scene relates to Hadrian's continuation and extension of Trajan's alimentary foundation: on the left the emperor with his suite stands on the rostra before the temple of the deified Julius Caesar and addresses representatives of the grateful people, while further to the right is a statuary group on a base - Trajan seated and Italia with her children standing before him to thank him for his charity. The second scene records Hadrian's magnanimous cancelling, by the public burning of the debt-registers, of debts owed to the State. In the background of each scene is a reproduction in low relief of buildings in the Forum in their precise topographical order; and from these can be reasonably inferred (assuming that the onlooker was meant to find in the sculptures representations of the buildings that he actually saw above and beyond the slabs) the exact position and orientation of the balustrades, the site of the Marsyas statue being known from literary sources. The figures are less crowded than in Trajanic work; but the architectural details fill the whole background and the heads and shoulders of the figures in the second plane are raised above those in the foreground. Note: For more information about the art and artists of Classical Antiquity, see: Greek Sculpture and Greek Art. For a list of the best statues, statuettes and reliefs produced during this period, see: Greatest Sculptures Ever. A still wider spacing of the figures characterises a fragmentary relief sculpture, again of the cancelling of public debts, now in Chatsworth House, Derbyshire, on which the actors wear the short Hadrianic beard; and a wholly classicising style marks three large, rectangular reliefs in the Palazzo dei Conservatori on the Capitol which clearly belonged to a sculptured arch of Hadrian's time. For although the imperial heads on these reliefs are mostly restorations, the hair and beard styles of the other figures are of that period. One scene shows the goddess Roma handing a globe to the emperor on his arrival in the capital soon mer his accession. Another depicts a dead empress - Plotina or Sabina - carried heavenwards on the back of the winged torch-bearing female figure of Aeternitas, while Hadrian sits watching and a male figure, personifying the Campus Martius, reclines beside the funeral pyre. In the third picture, which seems to be the pendant of the second, the emperor, mounted on a high platform, delivers an oration, probably in honour of the same dead empress, before the Genius of the Roman People and other listeners. These cold, correct, academic set-pieces, with their tracts of empty background and their calm, static actors, excite in us much less interest than do the eight roundels, re-used on the Arch of Constantine, which are sculptured with picturesque and graceful scenes of hunting, instinct with vivid movement, and of sacrifices on the hunting field. All the imperial heads were, as we have seen, re-cut in the early fourth century. But there can be no doubt that the original heads were those of Hadrian, whose passion for the chase was proverbial, whose youthful favourite, Antinous, can be recognised in several of the scenes, and among whose bronze medallion types are designs that are very close to some of the sculptured hunting episodes. For what Hadrianic monument these roundels were carved we do not know. We can only describe them as historical in so far as the emperor and some of the members of his suite whom they portrayed were public figures. [Note: For biographies of important sculptors from Classical Antiquity, see: Phidias (488-431 BCE), Myron (Active 480-444), Polykleitos/Polyclitus (5th century), Callimachus (Active 432-408), Skopas/Scopas (Active 395-350), Lysippos/Lysippus (c.395-305), Praxiteles (Active 375-335), Leochares (Active 340-320).]. It is, however, very probable that we should ascribe to the last year of Hadrian the only series of State reliefs dating from before the late antique period that have so far come to light in an east-Mediterranean land. These reliefs, found at Ephesus and now in Vienna, have often been assigned to the joint reign of Marcus Aurelius and Lucius Verus. But one slab shows a group of four imperial persons, two of whom can be readily identified as Hadrian and Antoninus Pius standing side by side with a sceptre between them in a manner that can only be explained as an allusion to the former's adoption of the latter as his colleague, heir, and successor in February 138 CE. The other two figures in the group, a youth and small boy, must be Marcus Aurelius and Lucius Verus, adopted as his sons by Pius. Pius had been popular in Asia when he served there as proconsul; and the whole monument could have been erected in Ephesus as a compliment to the dynasty of which he was now a member. A striking scene presents an emperor, whose head is unfortunately lost, wearing military dress and riding, above the reclining form of Tellus, in the Sun God's chariot, with Victory holding the horses' reins and the Sun himself leading them. This could be Pius' adoptive grandfather, the deified Trajan, imagined as the new Sol and as the pendant of Luna, who, on another slab, rides above the recumbent figure of Thalassa in a chariot drawn by stags, while Hesperus acts as charioteer and Nox leads the animals. The scenes depicting battles, sacrifices, groups of personifications of localities etc., could then allude to those oriental victories of Trajan that shed lustre on his immediate successors, although they themselves did not emulate his martial programme. If the battles on this monument represented Lucius Verus' Parthian campaigns of 162-4 CE, it would be difficult to see what warlike, divinised emperor would be relevant to such a context and why the adoption in 138 CE of Pius, in which the child Verus played but a minor part, should feature so prominently. The style and content of the Sol and Luna scenes, with their figures plastically modelled in very high relief, their paratactic arrangement of the actors, and preponderance of divine over human personages, are in the full Hellenistic sculptural tradition. But the presumably east-Greek carvers of these and of the other slabs were equally at home in the bold foreshortening of figures emerging from the background, in the rendering of depth in several receding planes, and in the use of vertical perspective in crowded groupings which we have so often found in western relief work. Noteworthy, too, in this east-Greek setting are the almost completely frontal poses of the family quartet. Of Antoninus Pius' peaceful activities no records in relief have survived. But his predecessor's paramount interest in the provinces and his lengthy tours abroad were commemorated on the temple of Divus Hadrianus, dedicated in the Campus Martius in 145 CE by a series of fine, statuesque, female figures carved in high relief and personifying countries and peoples of the Roman world, of which, however, only a few can be identified with any certainty. After Pius' death a column was set up, also in the Campus Martius, to commemorate his consecration. The shaft, which was plain, to judge by the coin types that represent it, has vanished; but its large base, now in the Vatican, has an inscription on one side and its three other sides sculptured. The relief on the principal face, composed of large, classicised figures, is as cold, correct, and academic as the three Hadrianic panels now in the Conservatori and resembles one of them very closely in composition and content. Pius and his empress, Faustina I, are carried heavenwards, attended by eagles, on the back of a winged male Genius who holds a celestial globe, while their flight is watched by Roma seated on the right and rhe personification of the Campus Martius reclining on the left. Since the whole monument was court-inspired, we can hardly dismiss as 'popular' and consciously anti-classical the very differently treated scene of diminutive figures that appears on each of the lateral faces of the base. This is a decursio or parade of foot-soldiers and horsemen, presumably one of the spectacles held at the emperor's funeral, in which cavalry were made to ride round a central, relatively static group of infantry. But in order not to obscure any of the participants and to fill the field in a manner satisfying to the eye, the horsemen have been turned by the sculptor into a kind of wreath encircling the foot-soldiers, those in front of the latter (from the onlooker's standpoint) being placed below them and those behind them, above them. Given the limited space at the artist's disposal, the figures, particularly those of the infantry, could not be other than short and stocky. But this very dumpiness serves to produce a sense of sturdy strength; and the carving of the individual men and horses is careful and naturalistic. The ledges, on which the upper and central figures rest, hold them down to earth and dispel any uncomfortable suggestion that they are floating in mid-air. NOTE: For later styles inspired by Roman relief sculpture, see: Classicism in Art (800 onwards). The extreme type of vertical or bird's-eye perspective found in these scenes on Pius' column-base is decoratively very effective and in view of the topic set and the field to be adorned its use was unavoidable. In the eleven large, rectangular panels that have come down to us from some triumphal monument, or monuments, of Marcus Aurelius' reign - three in the Conservatori and eight re-used on the attic of the Arch of Constantine - the subjects are such that the scenes could all be drawn in logical, horizontal perspective, as seen from the ordinary spectator's level. Only in one very crowded scene of sacrifice are the heads in the second and third planes raised above those in the foreground. Human activity is, for the most part, confined to the lower half of the picture, and buildings, trees, spears, banners, and standards occupy the upper portion of the field, sometimes crowding it, at other times leaving empty tracts of background, but always providing a sufficient filling. In one scene, that of an imperial largesse, the emperor and his suite, being raised on a very high platform, are in possession of the upper portion of the panel, while the recipients, men, women, and children, stand at ground level in the lower portion. Generally such scenes of largesse are viewed by the spectator from the side. But here the imperial group directly faces him and the citizens either move towards him or turn their backs on him; and in this case logic in perspective is combined with the full presentation of almost every actor. Despite the theatrical gestures and intense glances that appear in these reliefs here and there, our impression is that the monumental, generally well-proportioned figures are playing their parts with a stately, quiet dignity. The processions advance slowly; the crowds do not jostle unduly; the sacrifices are unhurried; the imperial speeches and audiences, whether to Roman troops, a suppliant barbarian chieftain, or a group of prisoners, are unimpassioned; and on the faces of the conquered there is little trace of anguish. The Antonine calm still prevails. Meanwhile, the richness of the background details and the lavish drilling of hair, beards, folds of drapery, arms, and armour lend a high degree of picturesqueness to the whole series. The column in the Campus Martius known as the Antonine or Marcus' Column is of Luna marble, stands 100 feet high, and carries on its shaft a band of sculptured reliefs in 20 spirals. These reliefs tell the story of two of Marcus Aurelius' campaigns against the northern barbarians, separated by the figure of a Victory as are the scenes from the two Dacian wars on Trajan's Column. The two campaigns have been variously identified as those of 169-72 CE and 174-5, those of 172-3 and 174-5, or those of 172-5 and 177-80. If the last set of dates were correct (and the case for it has been strongly argued), this column would be one of the columnae voted to Marcus after his death. 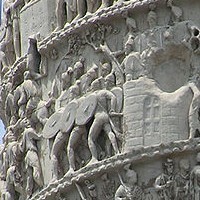 Otherwise it could have been begun as a victory monument, as was Trajan's Column, during his lifetime. The carving of the relief band must anyhow have been continued well into the reign of Commodus at least; but the detection of different hands and styles is complicated by the fact that the sculptures were much restored under Pope Sixtus V in 1589. An inscription set up by one Adrastus, Procurator of the Column under Septimius Severus, quotes from an official letter of 193 CE which authorised him to use for the building of his own house ten planks from the scaffolding 'that had to be erected' on the Column. This suggests that work was still being done on the sculptures up to that date; and the style of some of the reliefs in the band near the top is certainly close to that of Severan carving. One or two of these scenes look like replacements of earlier pictures. Trajan's Column was, of course, the model for that of Marcus. Here, as there, the story begins with a crossing of the Danube by the Roman troops, there are the same recurring episodes, and scene succeeds scene continuously without a break. Vertical perspective is no less freely used than on the earlier monument, the figures in the second plane being often raised quite clear of those in the foreground: rivers appear as on maps, while the boatloads of men crossing are seen from the horizontal, human viewpoint. On the other hand, there are several marked stylistic and technical divergencies between the two friezes. On the Antonine or Marcus' Column, there is little interlocking of adjacent scenes and we miss the Trajanic artist's skill in fusing together by subtle transitions incidents of different content. The total effect is less that of a moving film than of a series of juxtaposed still, pictures. Many of the scenes tend to break up into two parallel, horizontal, superimposed zones, so that the band loses its tapestry-like unity of design. Monotonous rows of figures in virtually identical poses now confront us. The relief is much higher than on Trajan's Column. Limbs, heads, and even bodies are worked wholly or almost in the round, as if free standing statuettes had been flattened at the back and applied to the wall of the shaft. The result is brighter highlights and darker pools of shade. The artist of Marcus' Column displays, on the whole, rather less interest in the landscape and architectural background. But buildings, army tents, the straw huts of the enemy and so on, are carefully delineated; and again the 'local colour' and the circumstantial military details suggest that the sketches of eyewitnesses were the basis of the frieze. As on the base of Pius' Column the squatness of the figures serves to express the toughness and dogged determination of the combatants. More important still is the contrast in attitude and atmosphere between the two relief bands. On Trajan's Column the emperor and his men are comrades, with whom he is in full rapport when he addresses them, rendered in profile and as completely unconcerned with the spectator of the frieze. In scenes of adlocutio on Marcus' Column the emperor is reared on a lofty podium or ledge of rock high above, and isolated from, his audience, and gazes full-face over their heads-at us. The princeps had become a dominus, independent of the human conflict and looking for our homage. The reliefs of Trajan's Column portray war as productive of peace, security, and order: the success and permanence of Graeco-Roman civilisation are there unquestioned; and the vanquished are the objects of a kindly, if realistic, humanitarian outlook. Here the Roman army faces an unknown world, full of fear, as the strained expressions of the soldiers show. Security has broken down and man is oppressed by the horror and tragedy of war for Romans and barbarians alike. Above the tortured bodies and agonised faces of the conquered and the rigid forms of the soldiers mechanically carrying out their orders broods the spectre of the Rain God, with water streaming from his hair, beard, wings, arms, and fingertips, perhaps the most haunting and imaginative figure that a Roman artist ever created. For the origins and development of 3-D art, see: Sculpture History.. The earliest historical reliefs of the Severan period known to us are those on the Arch with three passageways that stands in the north-west corner of the Roman Forum and was erected in 203 CE in honour of Septimius' eastern victories and in celebration of his first ten years of rule (decennalia). On either face of the Arch, above the side passageways, are panels with episodes from the Parthian war - sieges of cities, Roman troops on the march, imperial adlocutiones, etc. The panels are carved with masses of small, crowded figures in laterally spreading scenes that are composed in superimposed registers. In some ways, particularly in the zone arrangement, in the frontal presentation of the emperor in the adlocutiones, in the dumpy proportions of the men, and in the use of the bird's eye view perspective for rivers and for cities, down into which we look as from the sky, these carvings are close to those on the Column of Marcus. But here the relief is much lower, the individual figures are less clear,cut and well,rounded, and the whole effect is more niggling. The scenes are, in fact, more like paintings than sculptures, recalling the pictorial techniques of map-making and topographical painting; and one cannot but suspect that they had some connection with the 'public paintings', or triumphal pictures, of the Parthian campaigns which, according to Herodian, Septimius exhibited in Rome. There is no reason to suppose that in these scenes the designer was breaking deliberately with classical tradition. For the groups of soldiers and captives in the panels on the bases of the eight engaged columns are treated in a monumental, plastic manner; and the four flying Victories, each with a child personifying a Season below her feet, in the spandrels flanking the central passageway were obviously modelled on those of the spandrels of the Arch of Titus and of Trajan's Arch at Beneventum. Also plastic and monumental in their style are the figures in the Palazzo Sacchetri relief in Rome, which depicts Septimius, shown almost in profile, on a platform with his sons receiving a group of togate personages. The growing interest in frontality which we have already noted in Aurelian and Severan adlocutiones is illustrated again on the two main panels of the little Arch that clings to the western wall of the portico of the church of San Giorgio in Velabro, between the Palatine and the Tiber. It is known as the Porta Argentariorum, since its inscription states that it was dedicated to Septimius and his family in 204 CE by the bankers (argentarii) in collaboration with the wholesale cattle-dealers (negotiantes baarii). These two reliefs as we see them now are incomplete, for after the murders of Caracalla's father-in-law Plantianus in 205 CE, of his wife Plautilla in 211 CE, and of his brother Ceta in 212 CE, the portraits of the victims were removed. One panel now shows Caracalla by himself, sacrificing at a tripod and virtually full-face, although his head is inclined slightly towards the spectator's left. In the other panel Septimius and his empress are also sacrificing at a tripod. Here Julia Domna is completely, Septimius very nearly, frontal and both of them display no interest in one another or in the rite that they profess to be performing, but gaze straight before them into the distance as though to scan the faces, and accept the homage, of the onlookers. Noteworthy, too, is the flat, two-dimensional technique in which the figures are rendered. It is, however, a provincial monument, the great four-way Arch at Lepcis Magna in Tripolitania, that provides the fullest and most exciting document of Severan historical sculpture. For the date of the erection of this Arch we have not a shred of epigraphic evidence. But there can be little doubt that its sculptured scenes are of local significance and refer to specific ceremonies enacted at Lepcis on the occasion of the visit of the imperial family to Septimius' native city c.203 CE. These ceremonies seem to have been staged with two ends in view - first, to stress the glory won by Septimius through his victories in the east, and, secondly, while enhancing the whole imperial family's prestige, to exhibit Caracalla in particular as the emperor's elder son, colleague, and destined successor. The deities and personifications depicted in the reliefs could all be local, or locally worshipped, ones, here shown as participating in, or witnessing, the ceremonies. Of the four historical friezes that ran round the artic of the Arch, three are reasonably well preserved. The most important of them presents the triumphal entry of Septimius into Lepcis. The procession advances from left to right and both a group of horsemen on the left, rendered in vertical perspective, and a group of foot-soldiers on the right, carrying a ferculum (bier) with captives, move rightwards. So do the horses of the emperor's chariot. But the front of the chariot and Septimius and his two sons standing in it are completely full-face, as are also the personages walking at the horses' heads and the repetitive figures of bearded men, who, ranged in a serried row and reared above the foreground figures, watch the procession from the background as it passes by. These spectators are, of course, logically so posed. But the imperial group has been deliberately pulled round to a frontal view in order to give it a hieratic aspect and rivet our attention upon it. The pharos of Lepcis in the background of the scene and the relief of the Tyche of Lepcis between its patron deities, Hercules and Bacchus, on the front of the chariot make the local setting of the triumph evident. In another attic frieze, a scene of sacrifice in Julia Domna's honour, we find the same monotonous row of tiered, frontal onlookers in the background, while the figures in the foreground, if not all rigidly full-face, are basically frontal, being turned only very slightly towards the central act which they are supposed to be witnessing. In the third more or less complete frieze, the so-called dextrarum iunctio, in which Septimius, clasping the hand of Caracalla, presents him to Lepcis (again symbolised by the Tyche, Hercules, and Bacchus in the background) as his fellow Augustus, the posing of the figures is more varied and there is a more naturalistic concentration of the actors on the ceremony. Characteristic of all three friezes is the extensive use of drilling in the drapery and the almost wholly two, dimensional carving of the figures in the second plane. On the inner faces of each of the piers of the Lepcis Arch are three superimposed panels carved with historical scenes or groups of divinities. Sometimes there are three quite separate scenes, one above the other; other scenes occupy two tiers. In these we observe a wide variety of treatment. In the scene of Septimius' presentation of his elder son to the three Tychai of Tripolitania all the figures are almost completely frontal. In a scene of sacrifice, on the other hand, the lateral figures are almost completely in profile, turned centrewards. In the group of the local Capitoline Triad, with Septimius in the guise of Jupiter and Julia Domna in that of Juno, frontality again prevails. A group of deities, including Apollo and Diana, all in easy, three-quarter poses, is a purely Hellenistic, naturalistic piece. One relief, recomposed from many fragments, which occupied all three tiers, is a superb bird's-eye view of a beleagured city in the style of the reliefs on Marcus' Column and on the Severan Arch in the Roman Forum: the defenders are at the top and the attackers are shown below the walls in a series of mounting registers. This scene could well have been based on a triumphal painting, displayed at Lepcis, of an incident in the eastern campaigns. The flying Victories in the spandrels of the Lepcis Arch, despite their anatomical distortions, follow the models that we first encounter on Titus' Arch in Rome. But a new element is introduced in the unrealistically elongated figures of captives in the narrow panels at the corners of the Lepcis Arch. The material of this Arch is marble imported from Asia Minor (see also stone sculpture); and it would seem to be virtually certain that with the marble came Asiatic sculptors to carve it, so close are the affinities of the decorative elements on the Arch and other Severan buildings at Lepcis with second-century decorative work discovered at Aphrodisias in Caria. Here, then, would be east-Greek artists producing in a Latin speaking province sculptures that partly reflect Hellenistic, naturalistic tradition, partly offer counterparts of the pictorial narrative styles of State reliefs in Rome, and partly present in a developed form features with which western artists were as yet only experimenting - the extreme form of drill technique, with its highly patterned, black-and-white effects, and an insistence on frontality that recalls the 'Parthian' art of Palmyra, Dura, Europos, and Hatra. All this makes us wonder to what extent the sculptural methods that we think of as specifically Roman, because we normally meet them first on western monuments, were originally devised by east-Mediterranean masters and found their way gradually from the east to the capital. As its many fine portraits and carved sarcophagi prove, the third century in Rome was far from being barren in sculpture, but a stormy, troubled period, with one emperor not infrequently succeeding another with lightning rapidity, which was not calculated to inspire the erection of a continuous series of great victory monuments carved with State reliefs. We do, in fact, know of only two such monuments in the capital dating from between the Severan Arches and that of Constantine, namely the Arch, or triple gate, of Gallienus, put up in 262 CE, as its inscription records, on the site of the former Porta Esquilina, and an Arch of Diocletian (Arcus Novus) which spanned the Via Lata. Of the former only the central passage-way is left and no reliefs survive. From the site of the latter were recovered in the sixteenth century a piece (now in the Villa Medici in Rome) with two fragmentary figures and an inscribed date, that could refer to Diocletian's twentieth year of rule in 303-4 CE, and two column bases (now in the Boboli Gardens in Florence) each carved on three of its sides with reliefs of Victories, captives, and the Dioscuri. The monumental, plastically worked, and naturalistic figures on the piece and on the bases are so superior in style and treatment to those on the corresponding panels on the Arch of Constantine, which was erected only twelve years later, and to those on the contemporary (303 CE) column base of Diocletian in the Roman Forum, that it seems to be not unlikely that they were originally carved for an earlier Arch, perhaps a second, unrecorded Arch of the 'baroque' Gallienic period. On the Diocletianic column base, worked on all four sides with processional and sacrificial scenes and a date-bearing shield upheld by Victories, the relief is flat, the poses of the figures are mainly frontal, and the non-plastic, linear folds of the drapery are rendered by deeply drilled-our grooves. For more about Greco-Roman art, see: Art of Classical Antiquity (800 BCE - 450 CE). year of Galerius' Persian victory, and 305 CE, the year of the abdication of Diocletian and Maximian. The small scale of the figures and the general effect of the self-contained, superimposed friezes suggest the possibility that they were designed by a person or persons whose metier had been the decoration of sarcophagi. Two main types of composition are employed. There is the static, centralised type, in which the imperial figures appear at the centre of the scene in hieratic frontality, while the surrounding persons are placed symmetrically in balancing groups on either side. Such are the emperor's adlocutio, in which the speaker is on a much larger scale than the members of his audience, the imperial sacrifice, and the imperial 'epiphany', which shows the two Augusti seated and the two Caesars standing amid a galaxy of gods and personifications. The second type of composition is used for processional and battle scenes moving now briskly, now more slowly, in one main direction in a lively and naturalistic manner. The artist's choice between these types was obviously determined by the nature of the subject to be represented. A bird's-eye view of the background figures occurs in several scenes; and the outlines of some of the figures and objects in the second and third planes are incised on the background - a pictorial device found long before on Trajan's Column, on the Arch at Orange, and on the panels of the Julii Monument, dating from Augustan times, at St Remy in Provence. Much the same niggling 'sarcophagus style' and the same combination of the static, centralised type of composition with the laterally, moving type occur in the six narrow friezes which were carved for the Arch of Constantine in Rome and of which two appear on each of the main, and one on each of the short, facades. These reliefs represent six episodes in Constantine's campaign against Maxentius which ended in his mastery of Rome. Four of them are of the second type of scene - Constantine's departure from Milan, his siege of Verona, his victory at the Milvian Bridge, and his triumphal entry into the capital. In the siege scene there is a disproportion between the human figures and the city walls little greater than on the Columns of Trajan and Marcus: neither here nor in the other three military friezes do the tiering of the background personages or the dumpy, repetitive figures of the Roman soldiers present anything new; and the rendering here of the emperor on a much larger scale than the rest is paralleled on the Salonika Arch. The two remaining friezes, which depict Constantine's address and largesse to the citizens of Rome after the city had passed into his hands, are in the centralised, symmetrical, hieratic style. In the former the emperor stands full,face on a dais and gazes straight at us, not ar the crowd that is massed on either side: his proportions are only slightly larger than those of his entourage and of the crowd. But in the scene of largesse the emperor, seated on a lofty platform, rigidly frontal, is noticeably larger than his attendants and much larger still than the little figures of recipients grouped to right and left at ground level and than the figures of officials who distribute cash from a series of upper balconies. This difference in scale and the lack of variation in the posing of the citizens was clearly deliberate, to emphasise the distance that separates God's vice-regent from the common run of undistinguished humanity. The methods used to express ideas of this kind are basically the same in these Roman friezes and in those of the Salonika Arch; and both these methods and these ideas are the logical denouement of things at which the artists of late Antonine and Severan times were aiming. We need not suppose that the designers of either series of early fourth-century reliefs were in conscious revolt against classical standards. Indeed, the artist who planned the Constantinian carving on the Roman Arch was definitely not anti-classical in taste. The two reliefs of Sol and Luna in their chariots in the roundels on the short sides are obviously modelled on the eight Hadrianic roundels and are, if technically inferior to the latter, vigorously drawn and skilfully adapted to their circular fields. In the lying Victories with Seasons at their feet in the spandrels of the central passage-way, in the Water Deities in those of the lateral passage-ways, and in the groups of Victories and captives on the column bases, he followed the long-established traditions of Roman and Italian sculptured Arches. These more monumental figures are the least successful of all the Constantinian carvings on the Arch. Apart from the Seasons, which are as good as many on contemporary Seasons sarcophagi, those in the spandrels are ungainly and distorted, while those on the bases, in particular the Victories, are bodiless and two-dimensional, with drapery folds that fashion decorative linear patterns bur bear little or no relation to the forms beneath them. Here we must admit a falling,off from, not a rejection of, the classical ideal. For the final stage in the story of frontality in Roman historical sculpture we pass to New Rome, to the reliefs on the base of the obelisk set up by Theodosius in 390 CE in the hippodrome in Constantinople. Here the emperor and his family, seated or standing in strictly frontal poses and accompanied by officials, soldiers, and monotonous rows of repetitive spectators in two superimposed tiers, watch performances in the hippodrome - chariot races, dancing displays, and the actual erection of the obelisk. The late fourth-century Columns of Theodosius and Arcadius, both of which were drawn before they were destroyed, bore on their shafts spiral relief bands obviously modelled on those of the Roman Columns. Of the Column of Arcadius with scenes from the Gothic wars we have an especially fine set of drawings made by a German artist in the action. Thus these reliefs carry on, to the eve of the Byzantine epoch, the documentary, narrative style of historical sculpture that the Ara Pacis Augustae had inaugurated. Meanwhile the centralised composition, with the imperial group as the focal point of interest, was destined to play a long and significant role in the art of the Christian Church, with Christ and His heavenly court replacing the emperor and his entourage as the central, dominating theme. BACK TO: Part I of Roman Sculpture.  For more about Roman reliefs, see: Homepage.